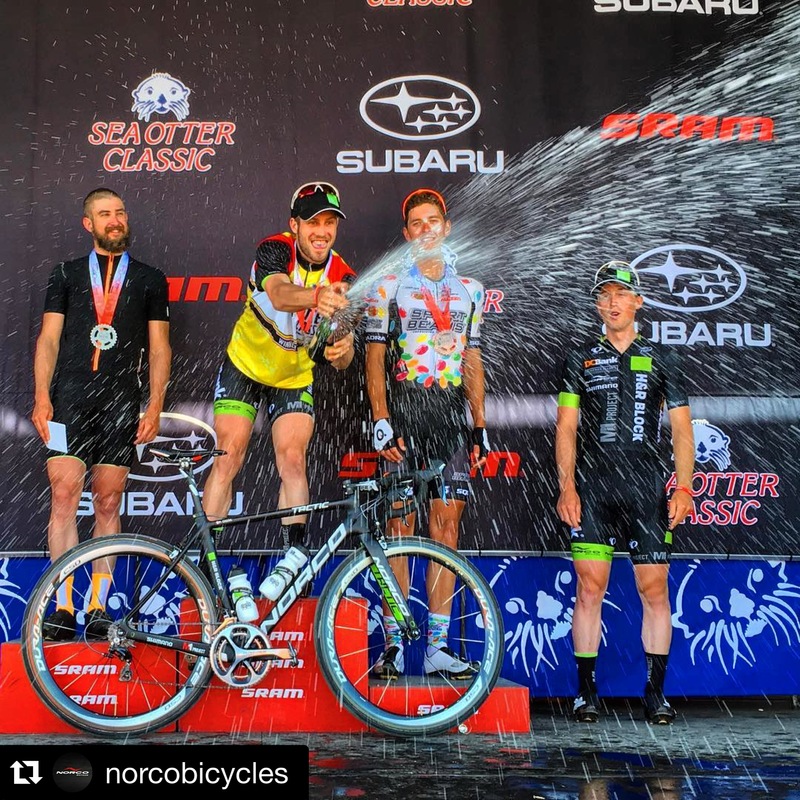 Sea Otter Classic, where vendors, food trucks, athletes, bike companies, and cycling enthusiasts come from all over the world to see what’s new in the world of cycling for 2016. This year’s Sea Otter did not disappoint. There are long days in the pits and baking in the heat, but I thoroughly enjoy it. Getting a chance to be back on the front-lines talking with consumers about all the Norco bikes I get to ride and letting people know how great they are is a fantastic feeling. However there is a lot more to Sea Otter. Some of the cycling events include dual slalom, downhill, XCO, short track, trials, the pump track challenge, criterium, road race, circuit race, cyclocross, enduro and more. Sea Otter literally has it all. The Leguna Seca Race Track is the home for Sea Otter, which is a hella neat venue to ride and participate on such an amazing racetrack. However, there are some limitations in Monterey, California. For Sea Otter to host so many events and disciplines, sometimes things overlap. Besides the challenges to organize timing, the terrain presents another challenge. The downhill is a little chill, the enduro had the world’s shortest stage, and the XCO was kind of on an open grass field. With respect to the XCO, this year the large 18 mile (or 30 mile, I don’t know) loop was abandoned by the pro men and women and traded for a short loop meeting the requirements of a HC class race. Fantastic, with good UCI points and cash on the line, only 8 laps of climbing the racetrack and descending grass switchbacks with one rock garden stood in the way. Could be worse. The short track was on Friday. It was ok. I wasn’t super pleased. 6.5/10 satisfaction – but I was stoked off of my new Revolver as it was riding very nice, and by nice I mean stiff and fast. Highlights of the short track are included in Antoine’s video https://vimeo.com/163086194. Recalling the race, one thing definitely stood out: over jumping a roller and landing so front heavy I thought I was going over the bars, but I kept it rubber side down. Saturday included the XCO. Fresh XCO track, fresh bike, fresh Kenda Saber Pros 2.2 tires to add some comfort on the bumpy grass and we were set. Quick warm-up, some efforts, but not too much as it was a billion degrees out (Fahrenheit – only a million Celsius). Then it was time to roll to the start. The start was set to drag out the track, then continue up the track, then onto some dirt, then back onto the track but uphill, then along the track flat, then onto dirt, then through a bottleneck. Why did I write it like that? Because that’s how many starts there were. I launched into the first single track not rolling in the best position, but still moving up. It took some time, a few packs shifted around me causing me to be alone for a few laps in the wind. Unfortunately the heat got to some others and I started to reel people in. Nearing the last 3 laps of 8 I pushed hard. My mind was clear of negativity and my legs were ready to roll. I pulled in some groups that were ahead of me and approaching the last kilometer of the race I saw Evan Guthrie and Andrew L’Esperance. I put in a good jab but couldn’t snake the boys. Good work all around. Definitely my best race since before nationals last year. I felt amazing. My mind was clear and ready. I rode reasonably well and my bike was amazing. Super stoked off of my 14th place finish – the number wasn’t incredible but the feeling was. After a great team dinner with the Norco crew, Sunday rolled around pretty early. I had a few things to do that day. I rolled into the pits early to help with set up and pack my bike. Loading up all my mountain bike stuff that I wanted sent home – as I would be in Joe Martin racing road for the rest of this endeavor. After the packing was complete I took a nice nap under the trailer on a packing blanket in my preparation for the circuit race with H&R Block Pro Cycling. The circuit race was simple: 75 minute race on the Leguna Seca racetrack. Dropping into the corkscrew (tight steep turn on the racetrack) was going to be sweet. The team tactics were to cover everything and then drop bombs in the sprint (win). I would be a lead-out man if all went to plan. Like most road races however, it didn’t go to plan. It was swell though. I followed a move, rolled with them gently to keep them invested, and waited for someone to bridge. Bailey bridged the gap with a few other guys. Our breakaway now had some serious horsepower. I was trying to save as much energy as possible while keeping everyone else invested. We had up to 1m45s and as little as 30 seconds. It yoyo’d depending on the pace in the front. Coming down to the last few laps Bailey started to work a little more, and me a little less. On the last lap I expected a gnarly attack from our Jelly Belly friend who had some horsepower but it didn’t come. I chased back one attack and shut it down quick. I waited for the group to catch me after the descent and once they did I sat on and Bailey went to the front. He pushed some big power and set me up for a great sprint. Coming out of the last corner the boys jumped, I was ready, I was born ready and I knew I could crush any of these guys. All was going well, I was coming up the outside pushing watts and not hurting yet, and then it happened. Michael Sheehan from Jelly Belly pinched me out against the fence – most likely not on purpose but now I was decelerating when I should’ve been accelerating in the sprint. Regardless, I got out of my pinch, swung into open road and threw watts like it was swag at Sea Otter (they give a lot of stuff away). Making my ground back, I quickly got past Jelly Belly and onto the next fellow, Conner McCutcheon. He was going good coming up the inside but I gave it one last kick and got him by a wheel. Boom! Just won a race at Sea Otter. Thanks to everyone that supported me this week. Norco Bicycles had an awesome set up in the pits at Sea Otter keeping the athletes comfortable. Kevin Haviland made sure our MTBs were running great. M1Project: H&R Block helped a ton and eased my consistent logistical battle of balancing two disciplines and teams. I thoroughly look forward to next year! I can’t wait to roll 17-mile drive! In Arkansas now for Joe Martin, be sure to watch social media for updates!